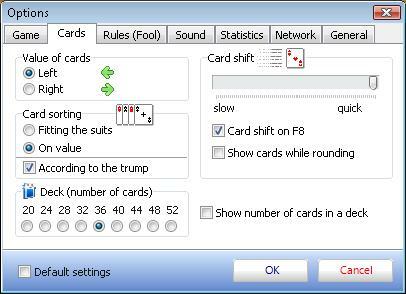 You may lay the cards out in any order at your own discretion. For instance, according to the suits, values, etc. The sorting is used in all the variant of the “Fool” except for the Czech one. 1. Go to "Game" -> "Options". 2. In the dialogue window go to "Cards". 3. Choose the appropriate way of sorting.